New South Wales amateur Jihye Park and Justine Dreher of France moved into a share of the halfway lead on day two of the Women’s NSW Open in Australia. At six-under-par, the pair sit a stroke ahead of French rookie Manon Mollé, Pannarat Thanapolboonyaras of Thailand and Norwegian LET rookie Marita Engzelius (below). England’s Meghan MacLaren, Lydia Hall of Wales, Olivia Cowan of Germany and Camilla Lennarth of Sweden share sixth place on four-under-par. She will play with another Korean-born Antipodean teenager in the third round of the Women’s NSW Open. Park made seven birdies and posted a new course record on Friday but was still disappointed that she had missed a six-footer on 17, which would have given her a 63. 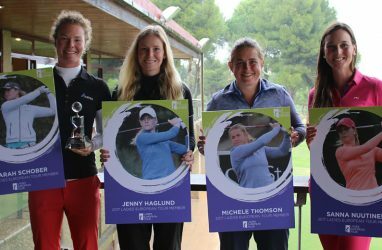 One shot back, fellow overnight co-leader Silvia Bañon from Spain carded a 73 and slipped back into a share of 10th position on three-under-par alongside Sweden’s Jenny Haglund and Australian trio Rebecca Artis, Sarah Kemp and Emily McLennan, a second-year member of the ALPG (below).